In this lesson, we will learn how to construct the perpendicular bisector of a line segment using a compass and a straightedge or ruler. We will also learn how a perpendicular bisector can be used to form a rhombus or kite and to find the midpoint of a line segment. The following diagram shows the perpendicular bisector of the line segment AB. Scroll down the page for examples and step-by-step solutions. The perpendicular bisector of a line segment AB is a line that divides the line AB into two equal parts at a right angle. How to construct a perpendicular bisector? Construct a perpendicular bisector of the given line segment AB. Step 1 : Stretch your compasses until it is more then half the length of AB. Put the sharp end at A and mark an arc above and another arc below line segment AB. Step 2 : Without changing the width of the compasses, put the sharp end at B and mark arcs above and below the line segment AB that will intersect with the arcs drawn in step 1. Step 3 : Join the two points where the arcs intersect with a straight line. This line is the perpendicular bisector of AB. P is the midpoint of AB. How to construct an isosceles triangle or a rhombus? The above construction steps can also be used to construct an isosceles triangle or a rhombus. We have constructed 4 isosceles triangles; AQB, ARB, QAR and ARB. We have also constructed a rhombus AQBR. How to construct a perpendicular bisector of a line segment? 1. Draw a line segment. 2. Set compasses to longer than half the length of line segment. 3. Construct two arcs, one centered at each end, so that two intersections are created. 4. Draw a line connecting the arc intersections. How to bisect a line segment using only a compass and straightedge? Forming either a Rhombus or a Kite and then joining opposite vertices with perpendicular diagonals bisecting each other. 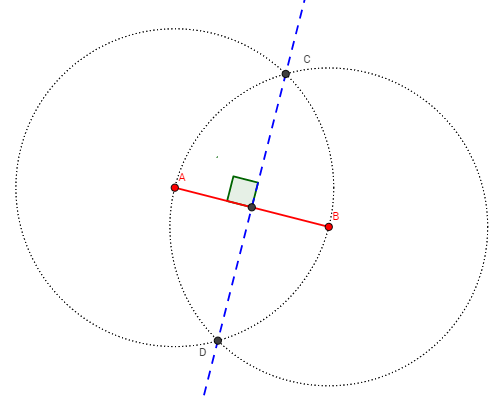 In this tutorial about geometric constructions, we walk through how to locate the mid-point of a line segment without a ruler, using a math compass and a straightedge. We can find the mid-point by draw a perpendicular bisector. 1. Set your compass so that it is slightly larger than half the length of the segment. 2. Place the compass at point A and draw a set of arcs above and below the line. 3. Without changing the compass setting, place the compass at point B and draw a set of arcs intersecting the first set of arcs. 4. Draw a point at each intersection of arcs. 5. Connect the two points with a line. 6. The point where the lines cross is the midpoint. This video explains how to construct the perpendicular bisectors of the sides of a triangle and define the properties of the perpendicular bisectors of the sides of a triangle. The circumcenter is the point of concurrency for the perpendicular bisectors of the sides of a triangle. The circumcenter is the center of a circle that passes through the vertices of the triangle. The circumcenter is equidistant to the vertices. We say the circle circumscribes the triangle.